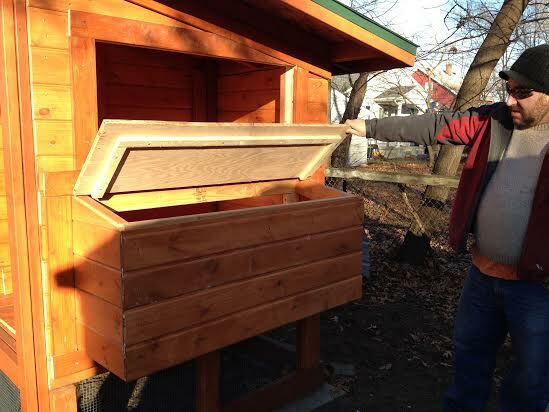 Matt lifts the lid of the nesting box. This is where we will collect the eggs. Never underestimate the power of a dozen doughnuts. That small box from Dutch Girl Donuts on Woodward in Detroit singlehandedly fueled a productive five-hour day on the chicken coop. 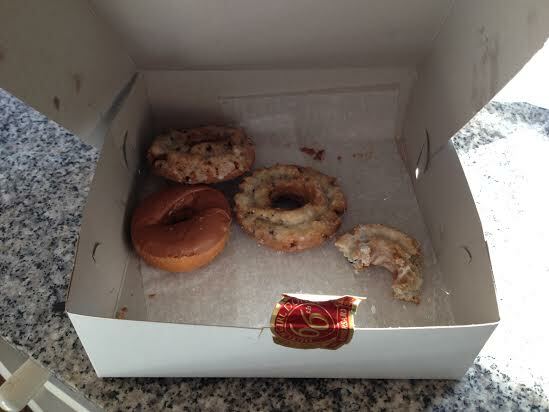 These doughnuts fueled our day of coop construction. Today Matt and I worked like a well oiled machine. Each task seamlessly led to the next; the only loss for the day was a busted drill bit. We also managed to use three different saws today: a jig saw, a miter saw and a circular saw (onto which Matt also installed a new blade!). In the end, we finished the nesting box, including the floor, lid and front wall. This is where the chickens will lay their eggs. We also completed trim for that side of the coop. We both agree the highlight of the day was cutting out the floor of the nesting box, and after struggling to make it fit, watching in awe as it just dropped into position. Woodwork is magic like that. Now, all we need to do before inspection is to finish the door into the run area, and build a door into the coop. We’re hoping our friend Eric can help us with the coop door because, frankly, it has us stumped. Matt and I have mad skills. Dare I say, mad chicken coop skills? But the madness ends with that coop door. Bloop. I’m feeling hopeful that we can finish the main components of the coop by the end of this month. I’m leaving a lot of the “busy work” for after we pass inspection. This includes the rest of the trim, attaching the ramp to the coop box, building two windows and a second coat of stain in a few spots. For tonight, I told Matt I would take him to dinner anywhere … his choice. I’m so grateful that’s he’s on board for this wicked awesome project, and thought it would be cool to reward him for his dedication. While he’s deciding on a restaurant, I’ll organize a few tools we still need to put away. Plus, I think there’s a doughnut calling my name.